The Vilnius Eastern Partnership Summit on 28-29th November represents a milestone in EU relations not just with respect to the six Eastern Partnership countries (EaP: Armenia, Azerbaijan, Belarus, Georgia, Moldova and particularly Ukraine), but also with the EU’s ‘strategic partner’ Russia. The turbulence and numerous speculations regarding expectations about the signature of the EU-Ukraine Association Agreement (comprising a Deep and Comprehensive Free Trade Agreement – AA/DCFTA), as well as progress in initialling similar future agreements with Georgia and Moldova, have been escalating before the summit. The association agreements would bring EaP signatory countries closer to the EU: not really closer to EU membership, but closer to the application of various EU norms and standards (takeover of the ‘acquis communautaire’) and – significantly – out of the Russian orbit, for the beginning at least symbolically. The last minute postponement of the EU-Ukraine AA/DCFTA signature announced by Ukraine’s government just one week before the summit represents a serious setback for the EU. Though the EU has no ‘Plan B’ and was stunned after Ukraine’s announcement, life will continue after the summit and new initiatives will have to be started. What are the relevant issues and challenges and what is at stake? 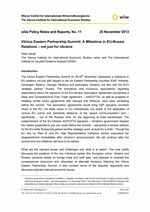 This note attempts to evaluate the consequences (economic and otherwise) of alternate decisions following the Vilnius Eastern Partnership Summit, reviews some of the disputed arguments and discusses selected relevant economic issues.